Responses wanted: Pope Francis is asking Catholics worldwide to contribute to the Synod on the Family’s second session held this October. BRISBANE Catholics can help guide discussions at the second session of the Synod on the Family in October by answering a new survey prepared by the Australian Catholic Bishops. The Australian Bishops have asked Catholics to give their opinions of marriage preparation, cohabitation and de facto relationships, the definition of marriage, and whether new language is needed in the family vocation. Questions concerning better support for adoption, how to prevent abortion, and ways to communicate the beauty and dignity of parenthood in various teachings like Pope Paul VI’s prophetic encyclical Humanae Vitae, are also in the survey. Catholic families in the Brisbane archdiocese have until February 10 to share their lived experiences of marriage and family life, and if applicable, suggest ways of improving the vocation, in the survey. 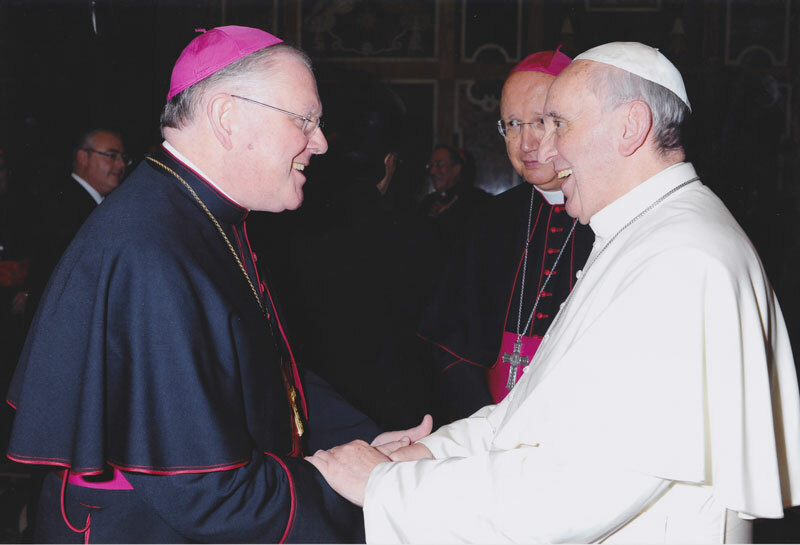 Papal meeting: Archbishop Mark Coleridge (left) will join the Holy Father Pope Francis for the Synod on the Family’s second session in October. Brisbane Archbishop Mark Coleridge and Darwin Bishop Eugene Hurley will be among hundreds reviewing the responses at the second phase in October. More than 750 Brisbane Catholics responded to the first survey released last year. The Brisbane Archdicoese in collaboration with Brisbane’s John Paul II Centre Family and Life will collate responses from the new survey. The Centre’s director Dr Ray Campbell encouraged families to respond truthfully about their own families and married vocation. “The Bishops want to know what’s been people’s experiences,” Dr Campbell said. While the first phase of the Synod identified the situations of families in the world, Dr Campbell said this upcoming second phase would help the Church respond to the present realities of family and marriage life. “I think the aim of the second Synod is how do we better respond to the situation so we can live out to the full the vocation of marriage and family life,” Dr Campbell said. Respond to the latest survey here.